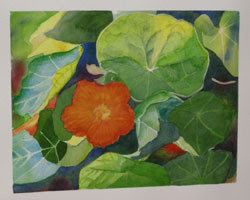 My Friday morning Drop-In Class worked on a painting of a nasturtium a few weeks ago. They worked for two weeks in class, then many completed the paintings at home as we started another project. Here are some of the results of the class. We were all quite pleased with the results. We were studying the use of varied amounts of water and pigment on our paper. We began with a very wet, wet-in-wet wash for the background. Then we gradually added more pigments to various stages of wet and dry paper for the remainder of the piece. The focus on the leaves was to create both crisp and soft edges. I think they did a great job!!! There are openings in both the Friday Drop-In Class and the Wednesday evening class. Check my website for details, directions, and supply lists.